Usagiya in Tokyo is where you’ll find premium dorayaki. (Their doors have been open from 1940. You know they're doing something very right!) In Osaka, the Akanemaru dorayaki pancakes are the most famous. Heat the frying pan over a low flame. Dip a paper towel in oil. Rub all over the pan. Turn the heat back on to a medium-low flame. Rub the oil out of the pan. Using a tablespoon, pour the batter into the pan. Dip a thin spatula (like the kind you use for fish fries) into oil. Let them fry for another 30 to 40 seconds. Repeat until you’ve got a gorgeous golden plate of Japanese dorayaki pancakes. For a traditional Japanese dorayaki, scoop red bean paste in between two pancakes. 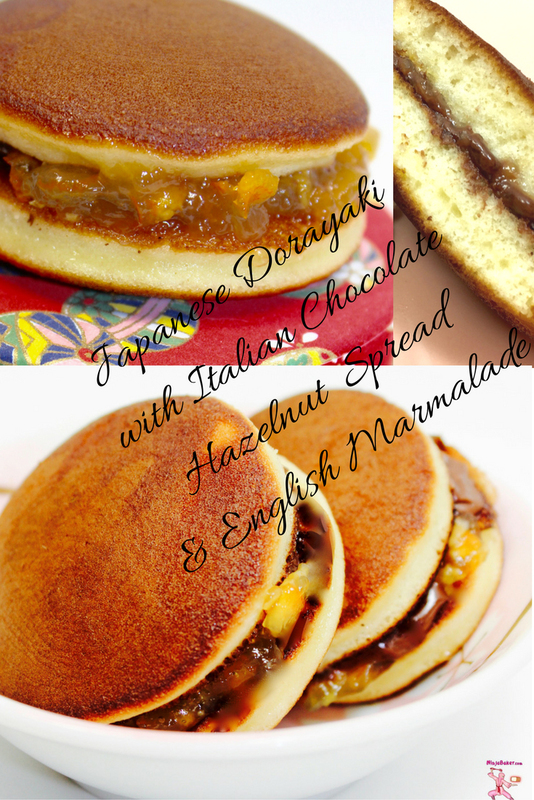 Italian chocolate hazelnut spread and English marmalade are brilliant dorayaki fillings, too. It’s the ultimate International House of Pancakes combo! 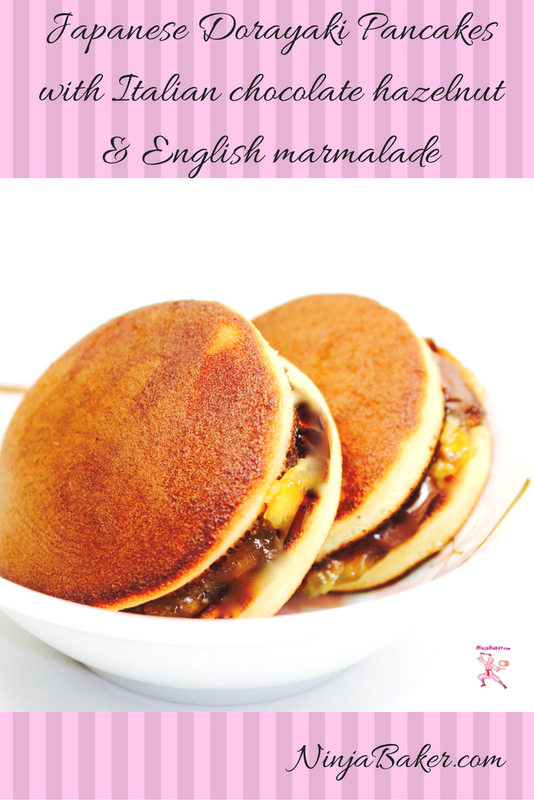 Japanese dorayaki pancakes are light, almost cake-like and delicious! 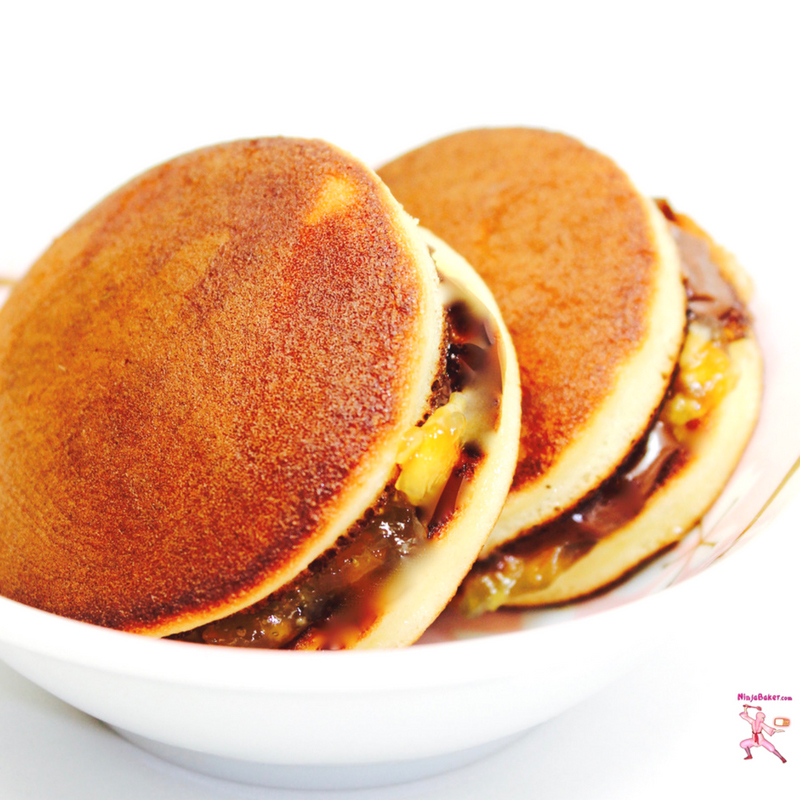 The golden dorayaki pancakes are traditionally stuffed with red bean paste. 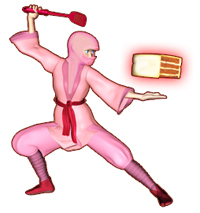 This Ninja Baker’s choice of Italian chocolate hazelnut spread and English marmalade slathered on the dorayaki pancakes are yummy, too. This recipe is from Namiko Chen of Just One Cookbook. The maestro of Japanese cooking is a pro. Her recipe is here. As a home cook, my take on dorayaki is slightly different. While some aspects of the instructions may differ, I wholeheartedly agree that scale-weighing ingredients helps tremendously. 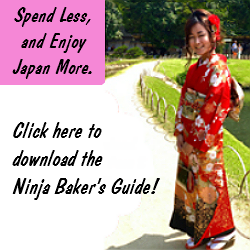 It’s a great investment whether you’re a pro or home cook or somewhere in between! Whisk the eggs in a large bowl. Pour the sugar in a stream into eggs and continue to whisk. Stir in the honey. Sift the flour and baking powder into the bowl. Cover with plastic wrap. Refrigerate for 15 to 20 minutes. Take off the plastic wrap and whisk in the tablespoon of water. Heat the pan. Turn off the heat. Dip a paper towel into vegetable oil. Coat the heated pan with the oil. Turn the heat back on (medium-low flame.) Wipe the oil out of the pan with a clean paper towel. With a tablespoon-measuring spoon, pour the batter in a circular fashion onto the pan. When little bubbles appear over almost the entire surface, flip the pancake. Cook for about another 30 seconds. Transfer to a plate. Seal the moistness in with a damp (clean) cotton cloth. Repeat the steps above until all the batter is gone. Slather red bean paste, chocolate hazelnut spread, marmalade or any other filling which makes your heart sing! Wishing you golden dorayaki delights in Japan or anywhere else in the world!